Tate is honoured to announce that Princess Eugenie will become the Royal Patron of the Tate Young Patrons as of end of April 2018. The patronage reflects Her Royal Highness’s personal passion for the visual arts, especially international modern and contemporary art. 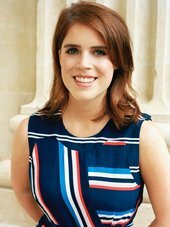 I am delighted to have Princess Eugenie involved in Tate Young Patrons. I know she will be an inspiring figure for our patrons and will play an active role in supporting Tate’s ambitious programme of exhibitions and events. Founded in 2007, the Young Patrons are Tate’s next generation of influential supporters, a vibrant group of emerging collectors, philanthropists and art enthusiasts aged under 40. There are currently over 170 active members, making Tate’s Young Patrons the biggest group of its kind in the UK. Tate Young Patrons contribute to conserving historic works and acquiring new works for the Tate collection. Each year, Tate Young Patrons support a diverse range of exhibitions across both Tate Britain and Tate Modern, such as Modigliani and All Too Human: Bacon, Freud and a Century of Painting Life. They also support education and learning programmes at Tate in London, including the pioneering Tate Exchange, launched following the opening of the Tate Modern’s Blavatnik Building in 2016. The Tate Young Patrons group is led by two Co-Chairs, Aurore Ogden and Alexander Petalas, and Young Patrons Ambassadors Bianca Chu, Christina Makris, Fiona McGovern, Eugenio Re Rebaudengo, Robert Sheffield, Navann Ty and Tyler Woolcott. Together they advise on the diversity of events offered in the Young Patrons programme, welcome and encourage Young Patrons in their support of Tate, and introduce new members to the group. The previous Chair of the Tate Young Patrons Ambassador Group, Her Royal Highness Princess Alia Al-Senussi, together with the former Young Patrons Ambassadors Count Indoo Sella di Monteluce and Federico Martin Castro Debernardi, have also played an instrumental role in growing the Young Patrons group over recent years, as well as establishing the Tate Young Patrons Party as a special moment to thank Young Patrons and encourage more art-lovers to support Tate. This year’s Young Patrons Party at Tate Modern will be attended by Princess Eugenie, alongside the group’s current co-chairs and ambassadors. For press enquiries contact pressoffice@tate.org.uk or call +44(0)20 7887 8730.